Although I have always believed there is no such thing as kinda pregnant, an intermediate Spades player or someone who a little bit racist, there are indeed levels of racism. If there was a scale on which you could measure bigotry, the racism threat meter’s colors would range from some-of-my-best-friends-are white to Make-America-Great-Again red. And somewhere near Donald-Trump-dog-whistle orange would be House Republican Congressional candidate Omar Navarro. Navarro is the Republican challenger for Auntie Maxine Waters congressional seat. He doesn’t have a chance in hell and he knows it so he’s taken the presidential route using Trump-tastic tactics to stir up crazies willing to follow his tiki torch-lit path to Congress. Yep, you read that correctly. In 2018, the year of our lord Mahershala Ali (shout out his True Detective skull merkin hairpiece! ), Navarro believes it’s perfectly fine to claim to put a woman “in her place”. Well, considering this is her 14th year as a representative of California’s 35th district, it sounds like her place is in Congress. Anyway, Navarro, the man with little chance of unsetting a god amongst mortals, is now talking with FBI and the Capitol Police after he posted a fake letter filled with every racist dog whistle you could imagine. The letter also falsely claimed that Auntie Maxie wanted “to resettle tens of thousands of refugees in her Los Angeles district,” The Los Angeles Times reports. Navarro is expected to meet with FBI agents at his California campaign office on Wednesday to discuss the fake document, which is addressed to OneUnited CEO Teri Williams and talks about the Los Angeles Urban Development Board, CAIR-LA’s executive director Hussam Ayloush and the possibility of housing refugees in Minnesota. According to the Times, Waters asked for police involvement after the letter, which looks like it was printed on Waters’ official stationery and includes her signature, appeared on Navarro’s social media. Navarro claimed in December that someone he didn’t know sent him the letter. He added that he didn’t authenticate the letter before posting it to Facebook and Twitter, and now distances himself from it even though it is shared about 800 times per week. Teri Williams A Black woman millionaire CEO who invests in the black community, which, to white people is scarier than Frankenstein on crystal meth. OneUnited: A black-owned bank, which is second only to reparations on the list of white phobias. Hussam Ayloush: One of the dreaded Muslims, or as Navarro voters would call them—“Islamists.” Even worse, Ayloush is an activist. CAIR-LA: The Council on American-Islamic Relations in Los Angeles, an advocacy group for Muslim-Americans. Minnesota: While it might conjure up images of Prince or Vikings to you, Minnesota is also home to the largest Somali population in the country, which conjures up images of the dreaded combination of Muslims and Africans. Los Angeles Urban Development Program: A made-up group that will supposedly bring Muslim refugees to Los Angeles in the “hoods” of South Central. 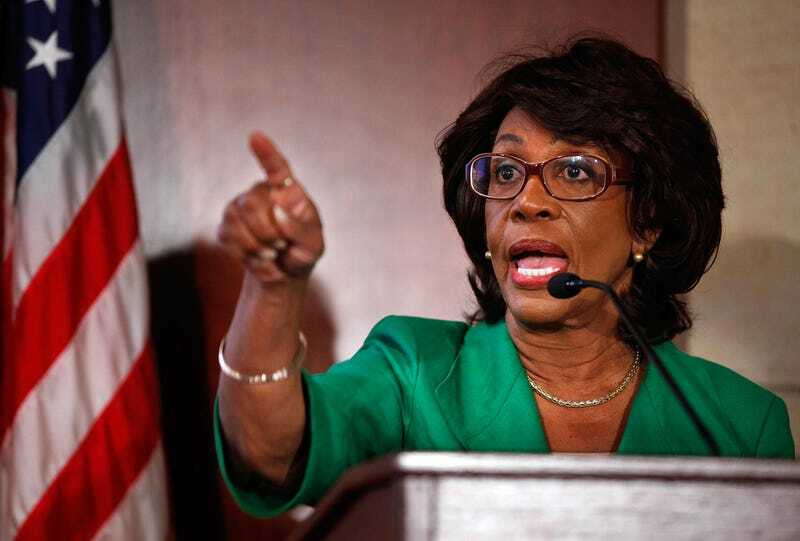 Speaker of the House: The greatest white fear of them all is that Auntie Maxine will become Speaker of the House and use her black girl magic to cast spells on white people forcing them to vote for reparations. And Navarro wants to represent you in Congress. “I don’t know why they are looking into me since I’m not the one who fabricated the letter,” Navarro told the Times, Monday, adding that he’d not spoken with the person who gave him the letter since December. In December, Waters’ chief of staff, Twaun Samuel, told the Times that the letter is “a forgery and a fake.” He also added that the queen doesn’t respond to the cries from peasants. In case you don’t have a clear picture of who Navarro is, the header image on his Twitter page is a photo of him and his wife and posing with the official mascots of the Trump administration, Diamond and Silk. And he wants to represent you in Congress. Editor’s Note: We have not yet received official confirmation from the Guinness Book of Racist World Records.